An Archives Page displays a summary of the available archives on your site (i.e., a list of all your monthly archives by month, a list of all your category archives by category, and so on). Upload the .zip file via Thesis > Boxes > Select Boxes > Upload Box. Once the box has been uploaded and appears in the list of available boxes, select its checkbox and then click Save Boxes. Go to Skin Editor > HTML. Click Home (i.e., the name of the currently displayed template) to access the Template Manager (screenshot), then click Add New. Enter “Archives Page” as the New Template Name, then click Create Template (you’ll be redirected to the new template after it’s been created). Click Archives Page, then select Page in the Copy from Template drop down menu. Click Copy Template, then click OK in the confirmation pop-up window. Using shift+drag, add the Archives Page Listing box to the Archives template, so that it is located inside the Post Box (example screenshot). 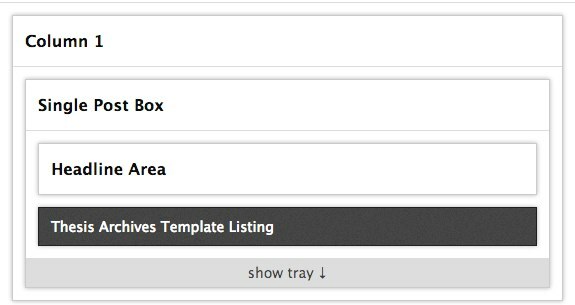 Using shift+drag, remove the Post Box → Content box from the template. Give a title to the Page (such as Archives). Under Thesis Skin Custom Template, choose Archives Page from the drop down menu.